Miscellaneous. Watercolour signed "GAK" (the initials of Lieutenant George Alvarde de Gavardie Kitchin RN serving onboard 1953-55). Undated.. This is an unusual painting of a Daring: it clearly shows the destroyer in her 1953/54 state when she, along with her sister DIANA, was fitted with an enlarged after funnel in an attempt to make the C-in-C Mediterranean, Admiral Mountbatten, a little less unhappy with the appearance of the two new ships that had joined his fleet in Malta! Either the added topweight was a problem, or the amount of room an enlarged funnel casing occupied on an already crowded 40mm gun deck did for this "good idea"; or it was decided that, if anything, this didn't actually improve their appearance and so, around 1954/55, the two ships reverted to their original funnel configuration - and we all got used to the Darings' profile! 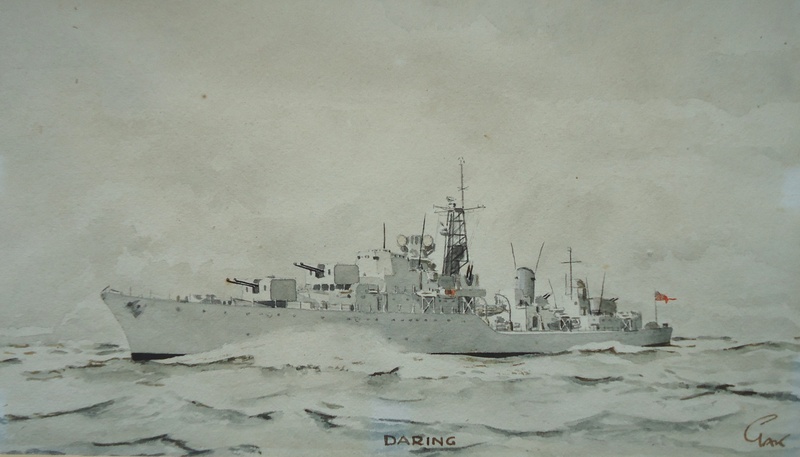 The watercolour was painted by Lieutenant George Kitchin RN who was serving onboard DARING at the time. His long career in the navy came to an end in the mid 1970s, his final appointment being to 128 Grainger Street, Newcastle-on-Tyne as Commodore Superintendent Contract Built Ships, an important and busy job which carried overseing responsibilty for warships that were building in UK yards not only for the Royal Navy but also for overseas navies such as Chile, Iran, Malaysia, Thailand, Canada, Venezuela.